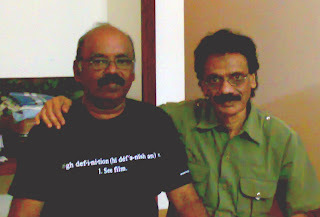 While I was in Ottapalam recently for the shooting of the film YUGAPURUSHAN, I rang up an old friend from my Institute days, my Senior, G.Sadasiva Panikkar ( G.S.Panikkar – 1970 – Direction Batch ). For the past few years he had been away from Trivandrum as he had settled at Cheruthruthy on the banks of the picturesque Bharathapuzha river, a popular location for many Malayalam films. He had graciously come down to my hotel along with his son and we spent a few hours together reminiscing about our friends, films of the past and the present trends in the Film Industry. I was the cinematographer for his maiden venture as Producer and Director of the Black and White Malayalam film AEKAKINI ( 1978) It was a tiny budgeted film made by a bunch of Film Institute graduates – Ravi Menon ( actor) , Suresh Babu and Raman Nair ( Editors), Panikkar and myself. It was based on a short story by eminent Malayalam writer M.T.Vasudevan Nair. The film was well appreciated and acclaimed when it was released.